Before you go out to look at horses, thoroughly browse the classifieds in the magazines for your breed and/or discipline. Scan the ads on general horse classified web sites as well as the sale pages of breeders’ websites. This will give you a sense of what you should expect to pay for the type of horse you want. If you work with a trainer or instructor, talk over your expectations and budget to make sure they are realistic. Attend some shows or competitions for your discipline and note what types of horses are winning. Frequently, there are horses advertised for sale at shows, which is an excellent opportunity to evaluate purchase prospects. If you ask, the seller must answer truthfully, so it’s in your best interest to ask the seller everything you might want to know, including details of the horse’s health and soundness history, his behavior in the show ring and on the trail, how he stands for the vet and farrier and whether he clips, ties and hauls. When you first call about a horse, have a list of questions ready, and ask them – it could save you the time and trouble of going to look at a horse that isn’t right for you. Equine Legal Solutions has developed a horse buying checklist to help you evaluate horses you are considering. Ask the seller to send you photos and video, if available, before you go out to see the horse. Tell the seller what you plan to do with the horse and ask the seller directly whether he thinks the horse would be suitable for you. We've found it useful to ask the seller why they are selling the horse – sometimes they are too honest for their own good! Don’t take anything for granted, and be specific in your questions. Trust your instincts – if a seller doesn’t answer your questions fully or makes you feel uncomfortable for asking, it’s time to move on. As the seller answers your questions, take notes. 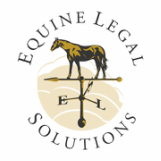 You may wish to use Equine Legal Solutions’ downloadable horse buying checklist. If you feel uncomfortable bringing your checklist with you to the barn, leave it in the truck and then write down all of the information right after you see the horse. Not only will your notes be a good guide to help you compare horses, they can also serve as a record of what the seller told you about the horse. Bring your camera and take pictures of the horse standing square from the front, rear and to each side, then review the photos later to make sure you didn’t overlook any flaws. Have a friend come along to videotape you riding the horse and review the tape when you get home. Even if you have years of experience, it’s smart to bring along an experienced friend when you’re horse shopping. Review the features that are most important to you and ask your friend to help keep you focused on them. If you have a friend who can operate a video camera or even just take a few snaps of you on the horse, all the better – see tip #3! On the way home, discuss the horse in detail and ask for your friend’s honest opinion. If you work with a trainer or instructor, be sure to take them along to see your final choice before you purchase a horse. You may have to pay them for their time, but if their input helps you select a horse that is right for you, that fee will be a good investment. We shudder whenever we hear of a horse bought “sight unseen.” There are so many things that a seller can do to disguise a horse’s condition and behavior, even in a video. There is absolutely no substitute for trying the horse out yourself. When you call to make an appointment to see a horse, tell the seller that you would like to see him tacked up after you get there. Arrive early and note whether the horse appears to have been worked already. Ask the seller to demonstrate everything that he says the horse can do, including clipping, tying and loading. Have the seller ride the horse first, then ride the horse yourself. If possible, come back to try out the horse a second time, even if it has to be the same day. Even for an inexpensive or “free” horse, we strongly recommend getting a vet check. As most experienced horse owners will admit, the initial purchase price of a horse is just the beginning of the investment! An old saying advises that it costs just as much to keep a good horse as it does to keep a bad one, and we’d add that it often costs more to keep a bad one! Ask your vet (not the seller’s vet) to check the horse for general health and soundness and screen for painkillers and tranquilizers. If your vet advises X-rays, get them – this is not the time to economize. Don’t be tempted to accept the seller’s word that the horse is sound – you’ll be glad that you took the time and relatively modest expense to have your vet examine the horse, if only for your peace of mind. Even if you are buying the horse from a friend, you will both rest easier knowing exactly what the horse’s condition was when you bought him, and if the horse becomes lame or ill later, having had a pre-purchase vet check will go a long way to preserve your friendship. If the horse’s location makes it impossible to have your own vet examine the horse, hire a local vet not affiliated with the seller to come out and examine the horse for you, and if the local vet takes X-rays, ask her to send a copy to your vet back home. Unless you put the entire purchase agreement in writing and have the seller sign it, it will be very difficult to prove what your agreement was. For example, if the seller made certain representations to you about the horse and his abilities, and those representations are an important factor in your purchase of the horse, you’d be wise to have the seller put those statements in writing. It’s amazing how the truth comes out when folks have to sign on the dotted line! If the seller refuses to put the agreement in writing, it’s time to move on to the next barn. ELS offers four different types of downloadable purchase agreements.